Giovany Aramis González (born September 19, 1985) is an American professional baseball pitcher in the New York Yankees organization. He has played in Major League Baseball (MLB) for the Oakland Athletics, Washington Nationals and Milwaukee Brewers. He is of Cuban descent. González was born in Hialeah, Florida, to a Cuban immigrant mother from Havana and a first-generation Cuban-American father from New Jersey. He attended Hialeah High School in Hialeah, for the first three years of his high school career, where they won two state championships and nearly won a third. After his junior year, he transferred over to Monsignor Edward Pace High School in 2004 where he played with former teammate Chris Marrero. He was drafted by the Chicago White Sox in the first round of the 2004 Major League Baseball draft. In 2005, he was traded to the Philadelphia Phillies along with Aaron Rowand and Daniel Haigwood for slugger Jim Thome. While with the Phillies, Baseball America rated González the number-2 prospect in their farm system behind Cole Hamels in 2006. In December 2006 he was traded back to the White Sox along with Gavin Floyd for Freddy García. González led the minor leagues with 185 strikeouts in 150 innings in 2007. On January 3, 2008, the White Sox traded González along with fellow prospects Ryan Sweeney and Fautino de los Santos to the Oakland Athletics for Outfielder Nick Swisher. He was ranked the #1 prospect in the White Sox system at the time of the trade. González was called up to the majors on August 5, 2008, and made his debut on August 6. Following the 2009 spring training camp, he was returned to the Triple-A Sacramento River Cats. González started the 2010 season throwing 6+ innings against the Los Angeles Angels of Anaheim. He allowed 2 runs on 6 hits, striking out 6 and walking 1 in the 10–4 win. González was selected to the 2011 MLB All-Star Game. At the 2011 All-Star Game in Phoenix, Arizona, González was called out to the mound with two outs in the bottom of the eighth inning and struck out the only batter he would face, Jay Bruce. On the final day of the 2011 season, González threw 11 strikeouts over eight shut-out innings against the Seattle Mariners to secure a career-high 16 wins for the season. On December 23, 2011, González was traded with Robert Gilliam to the Washington Nationals for Brad Peacock, Tom Milone, Derek Norris and A. J. Cole. On January 15, 2012 González signed a five-year extension worth $42 million through 2016 covering his arbitration-eligible years. The deal also included club options for 2017 and 2018. González became the first pitcher since 1918 to have three consecutive appearances in which he finished a start with at least six shutout innings and no more than two hits allowed. González set a Nationals record when he pitched 25 consecutive scoreless innings, that ended on April 29, 2012. When the 2012 MLB All-Star Game roster was announced on July 1, González found himself on it for the second time in his career. Later that same day, he earned his 11th win on the season after the Nationals topped the Atlanta Braves, 8–4. González would earn one more win in his last start before the All-Star break, pushing his record to 12–3 and lowering his ERA to 2.92, and in doing so, was tied for the most wins on the first half of the season. His win total tied a Nationals record set in 2005 by Liván Hernández. On August 8, 2012, González hit his first career home run off Houston Astros pitcher Armando Galarraga and pitched his second career complete game. On August 31, González pitched his first career shutout in a 10–0 rout of the St. Louis Cardinals. When González and the Nationals beat the Milwaukee Brewers on September 22, it moved his record to 20–8 and he became the first pitcher in the MLB to reach the 20-win mark on the season. He finished the regular season with a major league best 21 wins, to go along with a 2.89 ERA and 207 strikeouts, winning the 2012 Warren Spahn Award as the best left-handed pitcher in the majors. González finished third in NL Cy Young voting in 2012. González's name, along with those of other MLB players, was listed in connection with a clinic thought to produce performance-enhancing drugs in a January 2013 report. On August 5, 2013, Gio González was cleared of any wrongdoing having to do with the Biogenesis scandal. He was not among the 12 players who were suspended. In 2013, González had a record of 11–8 with a 3.36 ERA. In the first half of 2014, González went 6–5 with a 3.56 ERA. On July 20, 2014, González recorded his 1,000th career strikeout against the Milwaukee Brewers, including 511 strikeouts with the Oakland Athletics and 489 strikeouts with the Washington Nationals. He ended the 2014 season with a 10–10 record and a 3.57 ERA. In 2015, he was 11-8 with a 3.79 ERA and led the major leagues in allowing opposing batters the highest batting average on balls in play (.341). In 2016, he went 11-11 with a 4.57 ERA, his highest since 2009. His WAR of 0.9 was also his worst since 2009. In 2017 he was 15-9 with a 2.96 ERA. He led the major leagues in stolen bases of third allowed, with seven. To start 2018, he went 7-11 in 27 starts. He recorded 126 strikeouts while having a 4.57 ERA and a 1.5 WAR. On August 31, 2018, the Nationals traded González to the Milwaukee Brewers for KJ Harrison and Gilbert Lara. He would make five starts for the Brewers, going 3-0, posting a 2.13 ERA. In Game 4 of the NLCS against the Los Angeles Dodgers in 2-1 loss, Gonzalez suffered a high ankle sprain, attempting to field a ball hit by Yasiel Puig, ending his season and being replaced by Zach Davies on the Brewers roster. On March 19, 2019, González signed a minor league contract with the New York Yankees. The deal guarantees $3 million if he makes the big league roster and $300,000 for each start he makes. González throws four pitches: a four-seam fastball at 92–95 mph, a two-seam fastball at 91–95, a curveball at 78–82, and a changeup at 85–87 that is used against right-handed hitters. His curveball is used frequently when he is ahead in the count, especially against left-handers. My curveball is a blessing. My father taught it to me. He felt that it was a pitch he wanted me to learn, right on the side of the house, and it just ended up working. I never asked what the tricks were, or anything like that. He made it simple for me to use on my own form, and it works for me. I've never changed my grip since the day my dad showed me how to throw it. He taught me how to try to make it look exactly like a fastball. González is a strikeout pitcher, with a rate of nearly 1 per inning over his career. He was fourth in strikeouts per 9 innings pitched in the AL in 2011, and he is second in the NL for the 2012 season (as of 17 August 2012[update]). Gio González is married to Berenice Lea Moures, with whom he has two children. In 2012, González created the GIO (Giving Individuals Opportunities) foundation, a charity to assist medical patients in need of financial support. He is also a comic book hobbyist. ^ Castillo, Jorge (September 24, 2016). "For American-born players with Latin heritage, identity is complicated". Washington Post. Retrieved 24 September 2016. ^ Radano, Michael (May 1, 2006). "Hamels hoping healthy run leads to Phils' rotation". Pqasb.pqarchiver.com. Archived from the original on April 20, 2014. Retrieved August 13, 2012. ^ Ken Mandel (December 7, 2006). "Phils acquire Garcia from White Sox". Philadelphia.phillies.mlb.com. Archived from the original on April 21, 2014. Retrieved August 13, 2012. ^ "Gio Gonzalez set for debut on Wednesday". USA Today. August 5, 2008. Retrieved August 13, 2012. ^ "Oakland's Young Studs Make Roster". Sports Illustrated. April 4, 2009. Archived from the original on April 10, 2009. ^ "Nationals acquire All-Star lefthander Gio Gonzalez from Athletics as part of six-player trade". Nationals Press Release. December 23, 2011. Archived from the original on January 21, 2012. ^ Bill Ladson (January 15, 2012). "Nationals extend Gio Gonzalez's contract through 2016 season". MLB.com. Archived from the original on October 23, 2013. ^ Roger Schlueter (April 25, 2012). "MLB Notebook: Gio putting up zeroes". MLB.com. Archived from the original on April 27, 2012. ^ Sanchez, Jesse (July 1, 2012). "Rosters unveiled for 83rd All-Star Game: Three starters for Rangers, Yankees and Giants; Hamilton smashes vote record". MLB.com. Archived from the original on July 3, 2012. Retrieved July 9, 2012. ^ Wagner, James (July 8, 2012). "Gio Gonzalez picks up his 12th win in 4–1 victory over Rockies". The Washington Post. Archived from the original on July 3, 2012. Retrieved July 9, 2012. ^ Vingan, Adam (August 9, 2012). "Gio Gonzalez Hits First Career Home Run, Continues Trend of Strong Hitting From Nationals Pitchers". WRC-TV. Archived from the original on April 20, 2014. Retrieved August 13, 2012. ^ Ladson, Bill (September 22, 2012). "Gio is MLB's first 20-game winner as Nats roll". MLB.com. Retrieved September 22, 2012. ^ Kilgore, Adam (October 4, 2012). "Gio Gonzalez wins Warren Spahn Award". The Washington Post. Retrieved October 4, 2012. ^ Tim Elfrink (January 31, 2013). "A Miami Clinic Supplies Drugs to Sports' Biggest Names". Miami New Times. Archived from the original on January 30, 2013. Retrieved April 12, 2013. ^ "Gio Gonzalez, Melky Cabrera among players avoiding discipline in Biogenesis". Sports Illustrated. August 5, 2013. Archived from the original on August 8, 2013. Retrieved August 5, 2013. ^ Tariq Lee (July 19, 2014). "Airplane trouble delays Gio Gonzalez's return to Nats' rotation". The Washington Post. Retrieved July 30, 2014. ^ Daniel Popper (July 20, 2014). "Gio records 1,000th career strikeout". MLB.com. Archived from the original on August 8, 2014. Retrieved July 30, 2014. 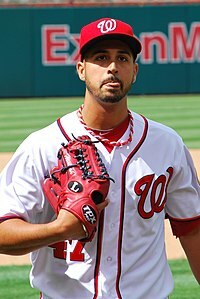 ^ a b c "Gio Gonzalez Statistics and History". Baseball-Reference.com. Retrieved August 19, 2012. ^ Hoch, Bryan (March 19, 2019). "Gio signs Minors deal with Yankees". MLB.com. Retrieved March 20, 2019. ^ "Brooks Baseball Home of the PitchFX Tool – Player Card: Gio Gonzalez". Brooks Baseball. Retrieved 19 August 2012. ^ Laurila, David (June 13, 2012). "Q&A: Jordan Zimmermann & Gio Gonzalez". Fangraphs. Retrieved August 19, 2012. ^ Milon, Hayley (June 5, 2012). "Gio's new charity paying immediate dividends". MLB.com. Archived from the original on October 23, 2013. Retrieved August 20, 2012. ^ "Kristina Akra sits down with Gio Gonzalez to discuss his personality, family and love of comics". YouTube. Retrieved August 20, 2012. Wikimedia Commons has media related to Gio Gonzalez. This page was last edited on 11 April 2019, at 04:37 (UTC).